All strain gaged transducers (load cells, extensometers, etc.) are considered "passive" instruments. Unlike active sensors, passive sensors typically require some sort of electrical energy (excitation) to provide an electrical output signal. Extensometers are typically excited (powered) by a voltage of 5 or 10 VDC (although, some signal conditioners do use 5 or 10 VAC). As a result, the calibrated output of such sensors is often expressed in millivolts per volt (mV/V). For example: an output of 2.451 mV/V means the output at full scale, with 10 volts excitation will be 24.510 millivolts. The inspection certificate provided with your extensometer will include this data. Since strain gage based extensometers are passive, they do require some external electronics for output. The electronics provide the excitation voltage and typically amplify the signal to a high level, DC voltage. 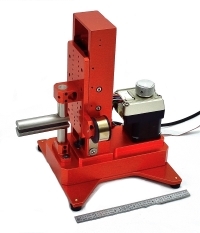 This high level output is used for direct readout or control of the test machine. In more advanced systems the voltage output can be converted into engineering units (% strain, etc.). For use with chart recorders, the output is typically set to a specified strain/in [strain/cm] on the graph paper. 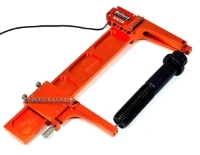 Your Reliant extensometer should only be used for tests within its rated temperature range. Operation outside of this range can cause permanent damage to the extensometer and or cable. If your test controller has a strain channel built-in, we can provide an extensometer with the proper connector to allow a true plug and play situation. However, most systems will still require some sort of calibration. For data acquisition systems with a strain gage signal conditioner, a interface connector can be installed on your extensometer to allow direct connection to the system. For acquisition boards without signal conditioning (those that require high level inputs), Reliant can provide a calibrated, extensometer / amplifier package with an adapter cable to interface to your acquisition board. Some manufacturers provide a system to include the extensometer's calibration in the extensometer's connector. They usually provide for this by using shunt calibration resistor(s) and a relay or a precise span-cut potentiometer. For these systems, calibration transfer is easily accomplished. 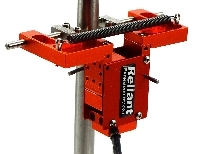 Extensometers purchased with electronics from Reliant are fully calibrated systems. They are factory set to display or output exact values. They are shipped "ready to use" and require no further calibration. Periodic re-calibration can be done by Reliant or most any calibration service. If you wish to calibrate extensometers yourself, Reliant's model CERHV - Very High Resolution Extensometer Calibrator is an excellent choice. Easy to use and with high resolution, our model CERHV will allow you to calibrate your extensometers to your specifications. Any competent calibration service will have no difficulty calibrating extensometers and electronics from Reliant. These companies can typically recalibrate the entire test system (including load cells, extensometers and other other sensors). Please contact us if you need help locating a calibration firm near you.